What’s that thing that came with my rotisserie? Using a rotisserie on a Weber grill can be a lot of fun, not to mention how great the food that comes off of one can taste. Many of our older model rotisseries came with a counterweight that was needed to help balance the rotisserie so the spit would rotate properly. Our current line of rotisseries are strong enough to rotate the spit without the need for a counterweight, so they are no longer included, but we sometimes still get questions related to using older model rotisseries that came with a counterweight. The purpose of the counterweight is to promote a more even rotation of the food placed onto the rotisserie shaft. It isn’t always necessary to use the counterweight, but if the food being cooked has an irregular shape it can be beneficial. For instance, things like roasts are shaped fairly evenly enough that the counterweight might not be needed. Poultry, however, can have a deep breast and a relatively flat back. The deeper the breast is relative to the body of the bird, the more likely it is for the rotisserie shaft to turn faster as the breast rotates downwards towards the bottom of the grill and then slower as the breast begins to rotate upwards again. First, unscrew the retaining loop (a small black ring) from the wooden rotisserie handle. Next, position the counterweight hanger between the handle and the retaining loop. Then, reattach the retaining loop by screwing it back into the handle, making sure that it is tightened down sufficiently to hold the counterweight in place and keep it from moving as the rotisserie shaft rotates. To properly position the counterweight for even rotation, make sure to have the counterweight positioned so that if the breast of the bird is pointing upwards on the shaft, the counterweight is pointing down. Double check to make sure the counterweight is firmly secured into place before turning on the rotisserie motor and you should now be ready to make some delicious food that will delight you and all your guests! 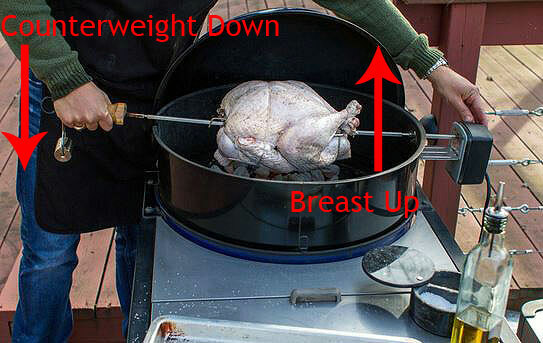 If you want to rotisserie a turkey like in the photo above, check out this blog post. 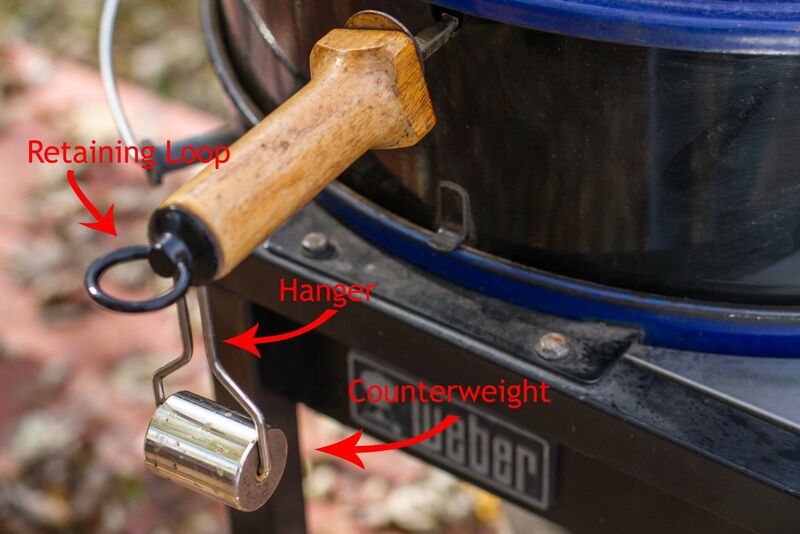 Learn more about how to set up your rotisserie here.